The European habit of being buried in one’s finest lace was exploited during the Second World War when, according to lace folklore, the lace was dug up and sold to occupying troops. The practice was said to be common in Greece, with Corfu in particular being mentioned, where the lace was sold to British Officers. 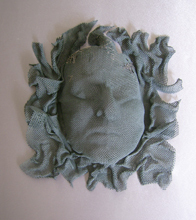 To be considered genuine ‘grave lace’ a piece had to have begun to decay and it is said that when supplies of genuine grave lace began to run short new lace would be distressed to appear old. 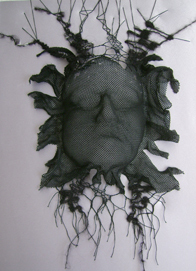 The image of decaying lace slowly disintegrating, with some areas intact, richly ornamented and intricately patterned, whilst other areas were barely recognisable or totally missing reminded me of my father’s slow decline from Lewy Body Parkinson’s Disease. One of the early visible signs of Parkinson’s disease is the face taking on a mask-like quality. The face muscles gradually take longer to respond to instructions from the brain and so the smile is lost. A net mask symbolising the communications network that has broken down represents the deadpan expression that replaces the smile. Failure of muscle response also causes mobility problems and satin sheets, represented here by the slipper-satin backing, are recommended to ease the problems of getting into and out of bed as well as turning over in the night. The Lewy Body aspect is memory loss, similar to Alzheimer’s disease. Short-term memory is badly affected with the sufferer often unable to recall what they had for breakfast an hour later. 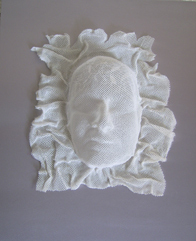 Such gaps in the memory are represented by the fragmentation of the network around the mask, sometimes woolly, sometimes misconnected and in places simply not there. Longer-term memory is less affected and a trip to a Garden Centre or visit to the Lost Gardens of Heligan would see my father reeling off the Latin names of trees and shrubs along with their preferred habitats. Like the ‘grave lace’ some areas of his memory were still rich and complex.